There's this old prayer in the Jewish tradition, called the She-he-chi-ah-nu. It's about being grateful. Taking a moment to acknowledge where you are in your life. To recognize the blessings you have, and not take them for granted. My Maternal Grandmother used to say it every time she ate the first plum of the season. I mean, you can walk by a pile of rocks. Or you can see the art in it, like the artist who stacked these at the beach the morning before I went walking there. I had to stop and look at it. Rocks were everywhere on the ground, but these rocks had a purpose. They made me stop and pay attention to the beauty all around me. This Thanksgiving, amid all the feasting, and the feelings of guilt about having, uh... stolen this country from the Native Americans, and the shopping frenzy Corporate America and our Government seem to be hoping we all go on starting Friday morning, take a moment. Think about some of the things that make you happy in your life. The people who make your days brighter. The music that makes you want to get up and dance. 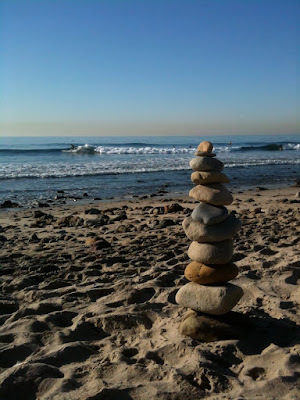 The art - or artful pile of rocks - that you find where you least expect it. The plums that get baked into pie. And add a sense of gratitude to the holiday. And then share that good, happy, grateful thought with someone else. Someone you care about. And maybe gratitude can be the emotion that travels the world over the next few days. It would make for a nice change of pace. I'll get us started: I'm grateful for my husband and daughter. And as soon as I finish writing this, I'm going to go tell them. Now it's your turn. What are you grateful for? Share that part of you with people you care about.